Parents/Guardians should note that school is closed for pupils on Tuesday 31 January 2012 in order to facilitate staff training that has been organisation by Newry & Mourne Area Learning Community. Former pupils Judith Foster, Samantha Hyde and Melissa Taylor have recently been presented with certificates from exam body CCEA to recognise their outstanding achievement in gaining 100% in their GCSE Art & Design exam in 2010/11. 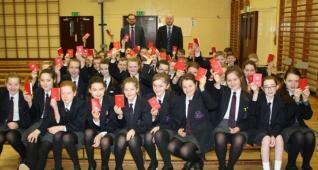 Congratulations to all 3 girls and also a big thank you to teacher Miss K Johnston for her support and guidance. 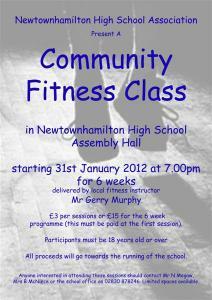 Newtownhamilton High School Association Community Fitness Classes will commence on Tuesday 31 January 2012 at 7.00pm in the assembly hall and will be delivered by local fitness instructor Mr Gerry Murphy. Workouts will include circuit training and team activities and are keenly priced at £3 per sessions or £15 for the 6 week programme (this must be paid at the first session). All proceeds will go towards the running of the school. Participants must be 18 years old or over and will be asked to complete a short enrolment form that requests information on any health issues. Anyone interested in attending these sessions should contact Mr N Megaw, Mrs B McNiece or the school office on 02830 878246. Limited spaces available. Hockey Girls should note that there will be a practice this Wednesday (25th Jan) after school at Tullyvallen's 3G pitch. It is important that everyone attends in order to prepare for the friendly fixture that has been arranged away to City of Armagh High School on Wednesday 1 February. The GCSE Art pupils made their way to the Ulster Museum in Belfast on Wednesday 18 January to view the work of the top GCSE Art candidates in N Ireland. Following this exhibition, a quick bite of lunch was had at McDonalds (Sprucefield) before the group headed back towards Newtownhamilton. 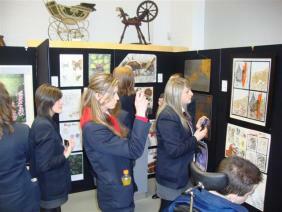 A final stop in Banbridge enabled the pupils to have a guided tour of the F E McWilliam Gallery. 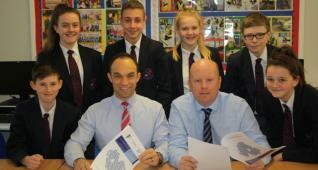 An enjoyable day with thanks going to Miss K Johnston and Mr R Gibson for providing supervision. Newtownhamilton High School opened their doors to the Primary 6 & 7 pupils and parents from the surrounding area on Wednesday 18 January. A large crowd was in attendance with additional seating having to be provided in the assembly hall as the evening commenced with a presentation from Principal Mr Garnet Mullan. After offering a warm welcome, Mr Mullan spoke about the excellent GCSE results (averaging 83% of pupils attaining 5 A*-C grades in the past 4 years) that had been achieved in recent years and the successful Vocational Enhancement Programme (in collaboration with Southern Regional College) that offered pupils the opportunity to gain qualifications in more practical orientated subjects. 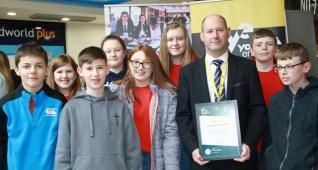 The Principal also spoke about the many other clubs, societies and programmes that were available to pupils within the school and highlighted the warm caring approach from all staff. Guests were then treated to musical items from the school chamber choir, string quartet and piano soloists Caroline McBride and James Blackwood. Music Teacher Miss L Graham explained that these pupils took a lead role in planning, rehearsing and delivering these performances. There was then an opportunity to tour the school and view the facilities and the many displays on show within individual subject departments. Finally, refreshments were served in the school canteen while there was also an opportunity to sample some home made pizzas, muffins etc that were prepared by pupils in the Home Economics department. 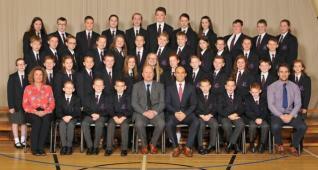 For further information regarding enrolment, transfer or transport issues, please contact Mr Mullan on 02830 878246. 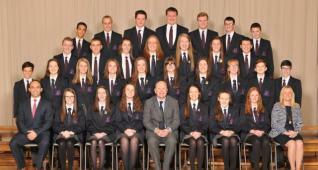 Click here to view the 2012/13 Prospectus. 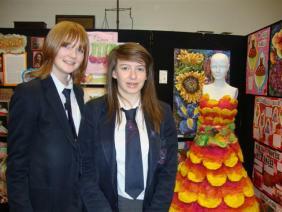 More photographs from Open Night can be accessed via the gallery section of this website. Primary 6 and 7 pupils are reminded that Open Night at Newtownhamilton High School will take place tonight (Wednesday 18 January). Everyone welcome - come along, it should be fun! 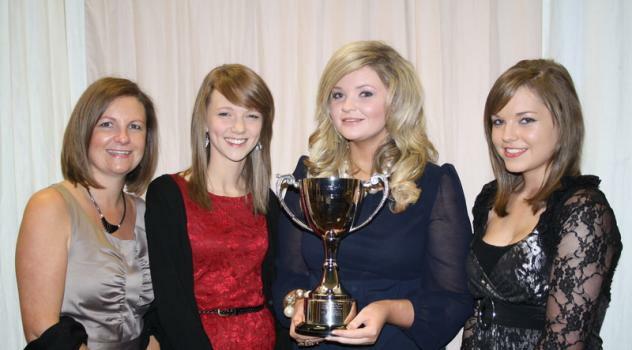 Pictured above are Alexandra Smyth, Louise Knight, Gemma McDowell and Lisa Henry at Open Night in January 2011. 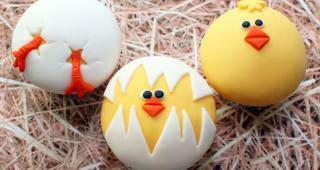 Have you overindulged on turkey, Christmas pudding and Quality Street over the festive period? If the answer is YES, then why not get back into shape in 2012 by attending a Community Fitness Class that is being run by Newtownhamilton High School Association. The 6 week block session will commence on Tuesday 31 January 2012 at 7.00pm in the assembly hall and will be delivered by local fitness instructor Mr Gerry Murphy. Workouts will include circuit training and team activities and are keenly priced at £3 per sessions or £15 for the 6 week programme (this must be paid at the first session). All proceeds will go towards the running of the school. at the heart of the community. A large number of parents and teachers were in attendance for the recent School Association meeting on Tuesday 10 January. During the meeting it was agreed that a weekly Community Fitness Class would be the next event to be run by the Association and that this would commence on Tuesday 31 January 2012 with more details to follow over the coming days. Further issues discussed at this meeting can be found in the minutes while information on the role and work of Newtownhamilton High School Association can be found on the Association page of this website. 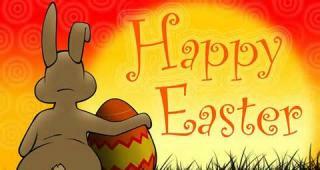 School Association Members should note that the next meeting will take place on Tuesday 27 March 2012 at 7.30pm. 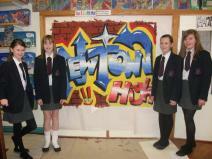 Newtownhamilton High School - at the heart of the community. 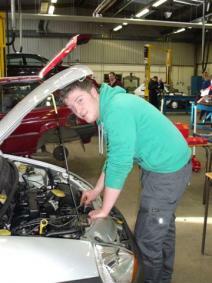 Pupils Alan Cooke and Steven Geary participated in the annual Skillbuild competition at Southern Regional College (Greenbank Campus, Newry) on Thursday 12 January. This event involved pupils from a wide range of schools within the SELB competing against each other in different vocational areas. 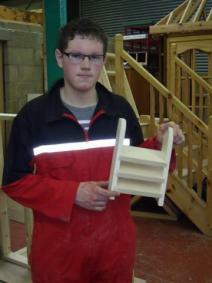 Both Alan and Steven did Newtownhamilton High School proud as Alan secured third place in the Motor Vehicle category while Steven participated in the Carpentry & Joinery competition and came runner-up. 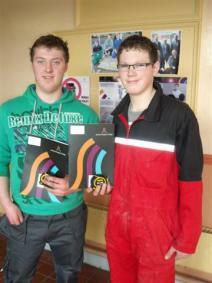 Congratulations to both boys on their achievements - well done. The Under 16 Football team caused an upset in the quarter-final of the Mid-Ulster Cup with victory over neighbours Markethill High School on Tuesday 10 January. Christopher Kennedy thought he had won the match for Newtownhamilton when he made it 1-0 with 2 minutes remaining however Markethill hit back with an injury time equaliser. With no further goals in extra-time, the game was settled by a penalty shootout in which strikes from Daryl Johnston and Matthew McNiece secured a 2-0 win. Goalkeeper Dean Govan excelled during the penalty shootout while Christopher Dundas produced an outstanding display in the centre of defence. The boys now look forward to a semi-final with the opposition still to be confirmed. Well done boys! A big thank you must go to HE Teacher Mrs C Alexander for her support to the Year 10 pupils with the cakes. There will be no hockey practice for girls on Wednesday 11 January as an after school aerobics has been arranged from 3-4pm. Miss Anderson has requested good attendance at the aerobics class in order to prepare for an aerobics display for Open Night on Wednesday 18 January. Any interested girls should speak to Miss Anderson for more information. The next meeting of the Newtownhamilton High School Association will be held on Tuesday 10 January 2012 at 7.30pm in Room 5. 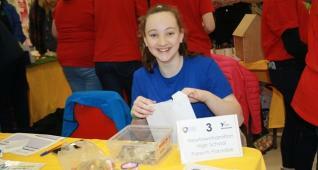 Information on the role and work of the School Association can be found on the Association page of this website. The Year 12 pupils will complete their mock examinations from Thursday 19 January to Wednesday 25 January (Click for Mock Timetable). The Year 12 Parents' Evening will take place on Thursday 9 February (3.30-5.30pm). Southern Regional College is closed on Thursday 5 January 2012 therefore pupils in 11V and 12V should use the time at home to complete any homework/coursework etc. The VEP course will resume on Thursday 12 January 2012.